You are here: Home / Den Talk / Our Superman: Appreciating Geroy Simon, one of the best we’ve ever seen. Our Superman: Appreciating Geroy Simon, one of the best we’ve ever seen. In my life time, I’ve been fortunate enough to watch some of the truly great athletes of all-time in their prime. Names that come to mind are Wayne Gretzky, Mario Lemieux, Michael Jordan, Tiger Woods, Warren Moon, Doug Flutie and Anthony Calvillo among others. In Vancouver sports history there have been popular athletes that have endeared themselves to fans and the community. Among them are Trevor Linden, Kirk McLean, Rick Hansen, Bob Lenarduzzi, Jim Young, Al Wilson and Lui Passaglia. But would you classify any of them as “superstars”? 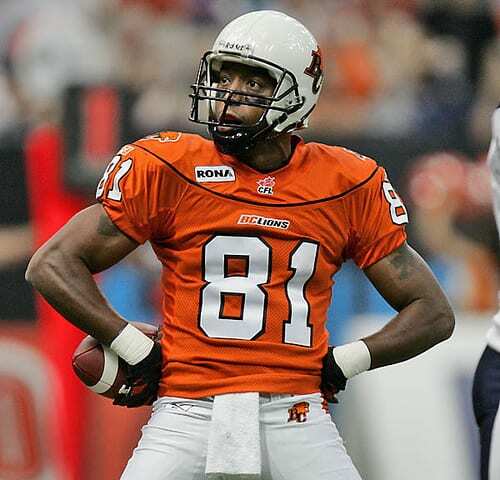 I feel that same good fortune when I realize I have watched the career of Geroy Simon and in particular his 11 years with the BC Lions. As Simon continues his climb to become the CFL’s all-time leader in receiving yards and his journey to the Canadian Football Hall of Fame, it’s time to realize how blessed football fans in British Columbia have been to not only watch his accomplishments off the field but also appreciate his all-star performance off it. A native of Johnstown, Pennsylvania, Simon had dreams of playing in the NFL. Given a real opportunity it’s quite possible that he may have never landed in the CFL. The NFL’s politics were the CFL’s gain and after starting his career behind a stacked receiving core in Winnipeg, Simon landed with the Lions and never looked back. Not only has Simon been an all-star on the field, he’s also become a member of the community. He lives in Vancouver year round and lends his name and time to many charity events. Imagine one of the CFL’s greatest receivers of all-time coaching your son’s football team. Yeah, he does that too. He’s an athlete giving back to his community, a quality not uncommon among CFL players. Simon certainly earns more than many CFL players as a star receiver, but it hasn’t stopped him from making a difference. Angus Reid, who has played with Simon his whole career, agrees that Simon probably deserves to be appreciated more as a sports icon in Vancouver. So enjoy him while you can football fans. We have been blessed to watch a great player, a classy individual who has made this city his home and has given back to it in return. The next time you talk about the great athletes in BC sports history, make sure that Geroy Simon is included in the discussion. He is truly one of the best of all-time. He’s our Superman. Thanks to Jacqueline Blackwell of the BC Lions for obtaining the audio for this blog on our behalf. >> Want to see Geroy Simon do his thing in the newly renovated BC Place? We have a great contest in the works that might get you there for opening night!